It is vitally important to use R.I.P. Fleas Extra correctly if eradication of fleas is to be successful. Follow this simple 5 step guide to ensure safe, effective application of R.I.P. Fleas Extra and a flea-free home! Prior to spraying, vacuum your home thoroughly. This allows R.I.P. Fleas Extra to penetrate deep into carpet fibres. 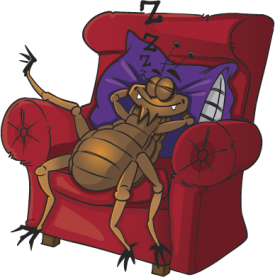 The vibrations and warmth from the vacuum cleaner also create a stimulus for adult fleas to emerge from the otherwise impenetrable pupae, allowing them to be exposed to the spray. Where possible, move furniture and vacuum underneath. Remove all pets (including small rodents, birds, fish, reptiles and insects) and children from the room being treated. If removal of large fish tanks or vivaria is not possible, cover tanks (for example, with thick blankets) and switch off aerator pumps (which should also be raised from the floor) during spraying and for one hour afterwards. Read all instructions and warnings on the can carefully before use. Close windows and doors. Invert the can and spray the entire floor area of the property, including wooden, laminate and tiled floors, skirting boards, under large items of furniture and in cracks and crevices. When spraying, hold the can approximately 30 cm from the surface being sprayed and spray in a criss-cross pattern to ensure even application. Use four seconds of spray to cover one square metre of floor space. Pets’ bedding and soft furnishings should also be sprayed. Before spraying large areas of carpet or soft furnishings, treat a small, inconspicuous patch first and allow to dry to confirm compatibility with the fabric. Remember to spray other locations where pets have been e.g. cars, outbuildings. Once each room has been sprayed, open the windows, leave the room and ventilate for at least 1 hour before reintroducing pets or children. Spray mist should have settled and surfaces should be dry to the touch. 24 hours after spraying, vacuum the property rapidly. Vacuum again at least twice a week for the next two weeks. The vibrations and warmth create a stimulus for adult fleas to emerge from the otherwise impenetrable pupae and shortens the pupal window.